The startup has begun to peddle its offerings of micro-inverters and a service for monitoring and managing solar arrays. Enphase Energy on Tuesday launched its first product, a micro-inverter along with a Web-based monitoring service, that the company said would boost solar electric production and provide better performance data. The two-year-old startup hopes to wow solar power producers with an inverter that would be attached to each solar panel and send performance data to a service center staffed by Enphase. The data would then go to an Enphase-staffed center for analysis. Inverters play a crucial role in solar installations because they convert the direct current (DC) produced by the panels in each installation into alternating current (AC) for feeding the grid. The startup’s offerings streamline the more conventional approach to converting power and monitoring a solar array’s performance. Solar power producers tend to install one large inverter that is responsible for converting all of the power generated by that system. The operators could monitor the performance on their own or outsource the job to another company, such as five-year-old Fat Spaniel Technologies in San Jose, Calif.
“We maximize energy harvest,” said Paul Nahi, CEO of Enphase, which is based north of San Francisco in Petaluma, Calif. “We simplify the design and implementation” of the solar energy projects, he said. Many different players have been attracted to the inverter market while the solar industry struggles to improve each pane’s output. Those players include SMA, KACO Solar, Fronius and Conergy. The market currently generates between $1.2 billion and $1.5 billion a year worldwide, said Vishal Sapru, industry manager for Frost & Sullivan’s Power Systems Group. There is no shortage of product launches, business deals and funding news from inverter makers. 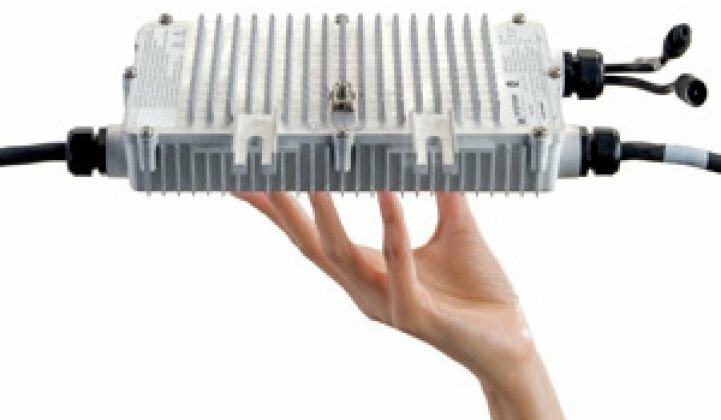 Xantrex Technology (TSX: XTX), based in Vancouver, British Columbia, said Monday that it inked a $1.9 million deal to sell its inverters to OptiSolar. Enphase is targeting the residential and business market. It would need to modify its offerings to attract utilities. Enphase has field-tested its technology with three customers – Borrego Solar Systems, Real Goods Solar and Owens Electric & Solar – by deploying 1,000 units of its system. Each Enphase system is made up of an inverter, a communications device that sends data over an AC power line, and the monitoring software and service. The result: a 5 percent to 25 percent increase in energy output, Nahi said. The system could also save 13 percent to 15 percent in installation costs, excluding the cost of solar panels. That’s compared to installing a solar array with a centralized inverter. Nahi contends that Enphase’s inverters collect more thorough data about each panel than a centralized converter. As a result, any problems that affect a panel’s performance can be detected and fixed more quickly. The startup plans to charge customers a monthly fee for the performance-monitoring service, which evaluates each panel every 10 minutes and alerts operators of any problems by email. Customers also can log on Enphase’s service Website to examine their solar panels’ performances on their own. t;para">Nahi wouldn’t disclose the price of the hardware and service. By selling the hardware, software and management service, Enphase shoulders a greater responsibility for the health of its customers’ solar arrays, Frost & Sullivan’s Sapru said. That will require more investments to staff the service center and safeguard the data. Enphase must secure more funding soon to maintain its momentum, Sapru said. The startup has raised $6.5 million since its inception in 2006. Investors include Third Point Management and Applied Ventures. Enphase is selling its products and services through installers and distributors such as AEE Solar, DC Power Systems, Focused Energy, Solar Depot and SunWize.